At least ten people have been stabbed after clashes broke out during a rally outside State Capitol in Sacramento, California. 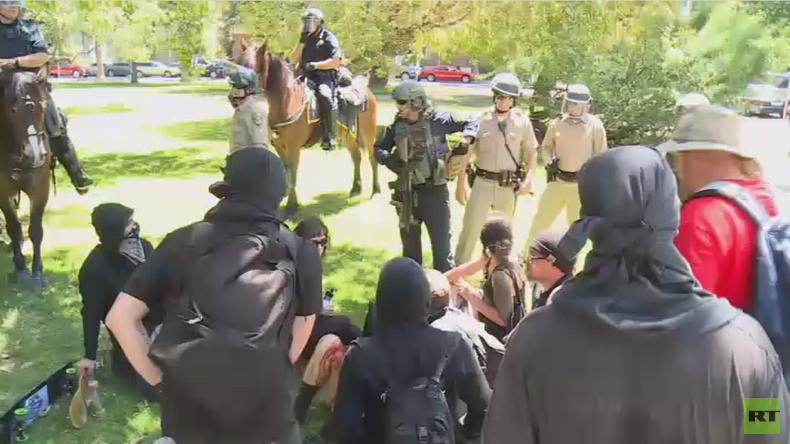 The violence broke out between far-right activists from the Traditionalist Worker Party and counter-protesters. 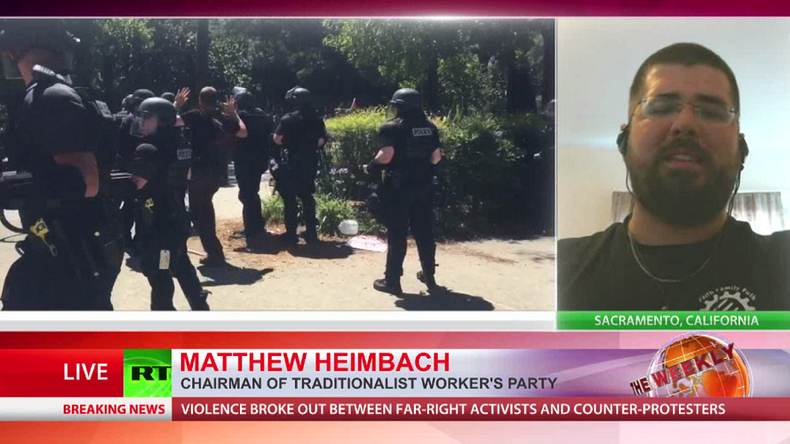 The Traditionalist Worker Party members, often described as a neo-Nazi group who have links to white supremacy and far-right causes, showed up for a planned rally at the Sacramento Capitol, where they were met by activists from Antifa Sacramento counter-protest, local media report. The rally was organized by the TWP to “protest against globalization and in defense of the right to free expression” and was reportedly also attended by members of the Golden State Skinheads, Blood & Honor, National Socialist Movement and Ku Klux Klan. Sacramento Fire Department (SFD) said a total of seven patients were transported to nearby hospitals from the site of the incident, some of them in critical condition from stab wounds. They however didn’t specify which group the injured were from. 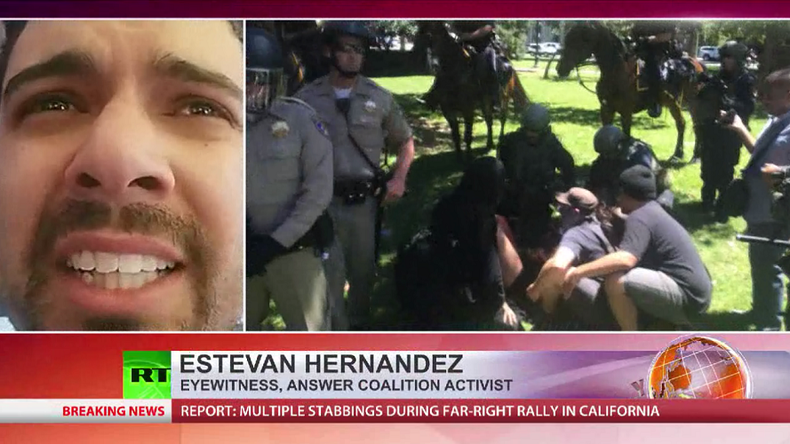 No arrests were made according to a local ABC 10 network reporter, who captured some of the shocking violence that erupted between the groups, and said police used tear gas to disperse the rival protesters. “We will help you, your family, and your town while the other parties are fighting a thousand miles from home over how to help (or bomb) people ten thousand miles from home,” it says. The group was listed as one of the Southern Poverty Law Center’s ‘Advanced White Supremacy’ hate groups, active in Ohio, Kentucky and Tennessee. The incident is just the latest in a rising number of clashes between the far-left and far-right in the United States. In February, there were violent clashes during a planned Ku Klux Klan rally that also took place in California. Brian Levin, director of the center for the study of hate and extremism, told RT he believes the clashes are the result of public disillusionment in the United States. “When people feel that the United States is heading the wrong direction, and they’re confused about what’s going on with their place in the world, these messages from extremists can direct and amplify these fears into things that become really irrational,” said Levin. “But make no mistake, on the left here in the United States there is a fringe that looks for violent confrontations whenever hate groups try to rally, particularly in Metropolitan areas,” he added. Political analyst Max Abrahms says this type of violence has a history in the US, dating back to slavery and resistance in the South, only now it involves “today’s anti-Muslim, Islamophobia, xenophobia, but we’re in a different stage now insofar that it’s linked to a major party candidate. “I have to think that this neo-Nazi turnout was probably more likely to be pro-Trump, and had he not been running, then maybe there wouldn’t be this rally in the first place,” said Abrahms. “One could raise real questions about whether they should have the liberty to protest because it’s impossible to separate their ideology from their violent tactics."